His research has been published in national and international oncology meetings and he remains actively involved in research at Ironwood Cancer & Research Centers. He has been practicing in the East Valley since 2003, initially in solo practice and since 2006 as part of Ironwood Cancer & Research Centers. He also serves on the Dignity Health East Valley Board of Directors for Mercy Gilbert and Chandler Regional Hospitals. A strong patient advocate, he routinely picks up the phone to communicate with other physicians and health insurance companies on his patient’s behalf. He has been nominated as “Top Doc” in medical oncology by his peers several times in Phoenix Magazine. As an extended faculty at Midwestern University, he mentors medical students during their Oncology rotations. He is well respected by his peers in the community for his expertise in solid tumors. He lives in the Phoenix area with his wife and twin daughters and dog Frodo! In his spare time, he may be seen hiking with his family, riding his road bike or camping in the AZ high country. 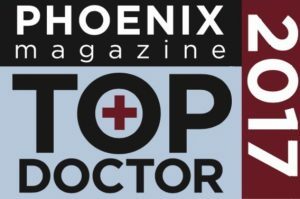 Dr. Bhalla was recently recognized as one of Phoenix Magazine’s Top Doctors in 2017. Read more about Dr. Bhalla here. Dr. Bhalla is fluent in English, Punjabi, and Hindi and accepts patients at our Chandler and Gilbert locations.